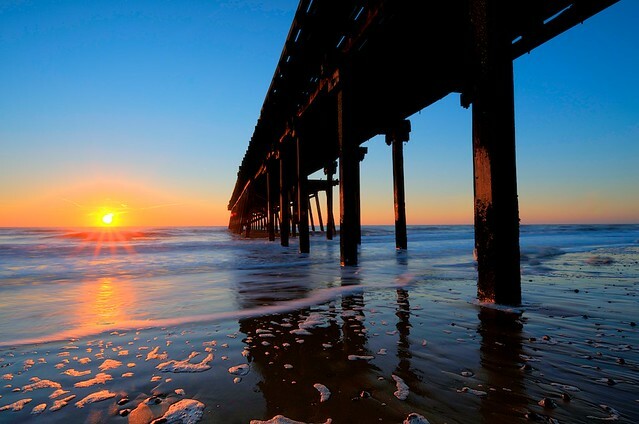 This beautiful sandy beach is situated in an area of Suffolk known as the “Sunrise Coast”, a cluster of seaside resort towns renowned for their blue flag beaches and breathtaking scenery. On a hot summer’s day this beach rivals anywhere in the Mediterranean with crystal blue water and its huge expanse of luscious golden sands. The water quality here is excellent and there are an abundance of activities available such as snorkelling, jet skiing, surfing and decent fishing. Sadly, dogs are banned from the beach from the start of May to the end of September but are free to use it for the rest of the year. A peaceful, picturesque shingle and sand beach that’s perfect for a stroll in any weather. Denes Beach is backed by marshes with Southwold to one side and the mouth of River Blyth on the other, making for an excellent mix of spectacular scenery. What’s more there aren’t any dog restrictions so you’re free to take the pooch along with you and watch them leap through the waves. If you’re feeling romantic or you’re a bit of an early bird this beach is the ideal spot for watching the sunset, take a blanket and flask of tea and sit back and enjoy. Arguably one of Suffolk’s best known beaches, this sand and shingle paradise backs onto the charming seaside town of Aldeburgh and the pretty blues, yellows and pinks of the seafront houses adds to the character and quirkiness of the area. 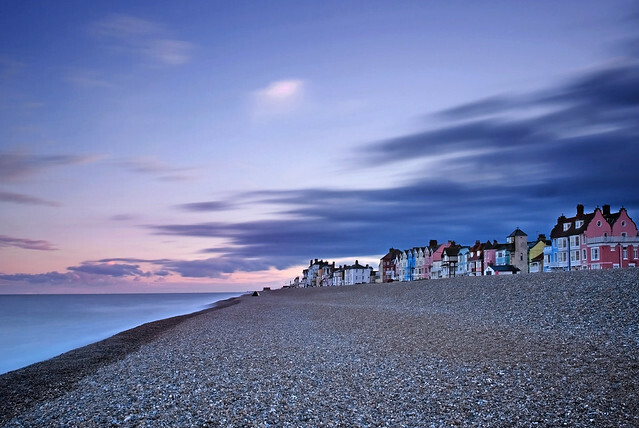 Aldeburgh is known for its strong connection to arts and culture, much of which can be seen on the beach itself. Most notably is perhaps ‘The Scallop’, a 15 feet tall stainless steel scallop designed by Suffolk-based artist Maggie Hambling in honour of Benjamin Britten who used to walk along the beach. For when you start to get peckish the town also boasts some of the best fish & chips on the East Coast and are well worth a try. 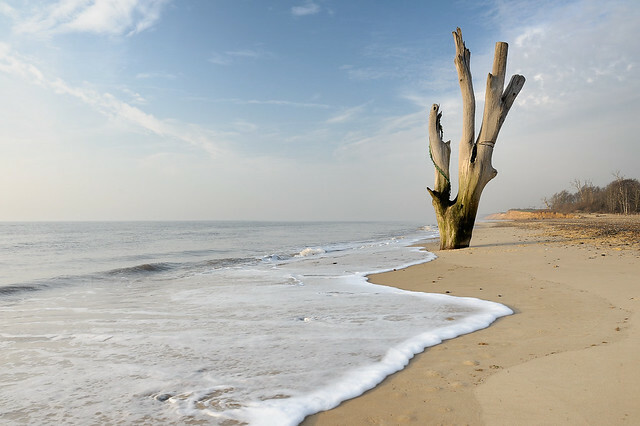 A beach for nature lovers, this picturesque little beach is just a short walk from Southwold. Backed by sand–dunes there are plenty of spots to nestle down and enjoy a picnic, catch a few rays on a sunny day, or simply lie back and watch the waves roll in. Walberswick Beach is bordered on by both the Walberswick Nature Reserve and a meander in either direction which will take you past stunning sights of marsh and heathland. It is dog friendly, making it a terrific spot for a long walk on a weekend, savouring the peace with sea on one side and marsh land on the other. The village itself has a very olde worlde feel and is full of pretty sights; it is also known as the “home of British crabbing”. Dunwich Beach is a haven for wildlife. Owned and maintained by the National Trust, it was once a thriving sea port but as time went on was gradually reclaimed by the sea. Today, almost none of the town is left except for a seemingly endless expanse of beautiful shingle. The beach itself is tucked away between the break of two cliffs opening out at the end of the road – a truly wonderful site to behold. The Dunwich Heath runs parallel to the beach and much of the area’s coastline, and as such there is an abundance of wildlife in the area making it an ideal location for nature enthusiasts. If the weather isn’t great, the Trust owns a charming tearoom which is a great spot to take a break and warm up. 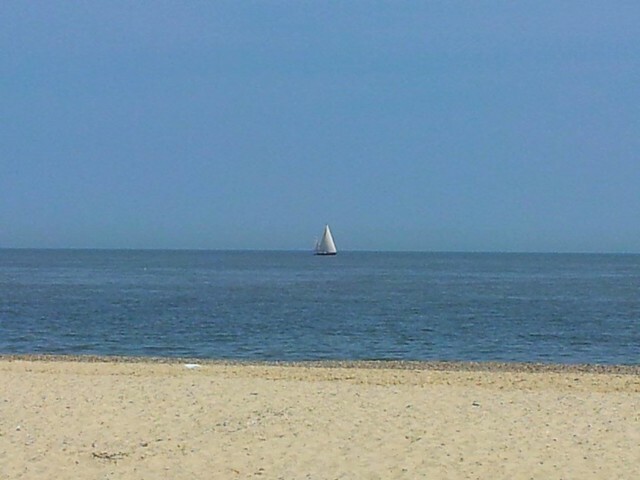 Just north of Aldeburgh, Thorpeness is the quintessential English beach village. It is well known for its tourism being home to a large golf course and the huge boating lake known as The Meare. The beach itself is a steep shelf of shingle that leads down to a bank of sand at low tide. Similar to Aldeburgh the beachfront is lined with brightly coloured Tudor and modern houses. The beach is dog friendly and has a decent amount of cafés, restaurants and shop nearby; it’s also a very good location for fishing. 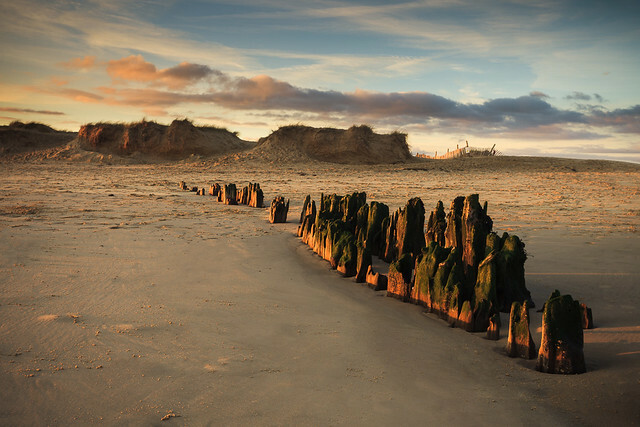 Stretching from Covehithe Broad to Benacre Broad, Covehithe Beach is eerily beautiful with salt worn tree trunks – left from the gradual erosion over the years – lining the shore line. Enjoying views of Southwold and its long pier reaching out into sea, the crumbling cliff path, nesting birds and the smell of herbs drifting in the sea breeze, Covehithe is Suffolk’s best kept secret. It can only be reached on foot or bike via a footpath just before the church. A much quieter beach than some of the others on this list, you can marvel at the remains of St Andrews Church, or simply stroll along the shoreline amongst the eerie, sculpture-like tree stumps. The beauty of Covehithe lies in its decay, each year a little bit more is lost to erosion, so we treasure it all the more. Be sure to visit before it’s too late. 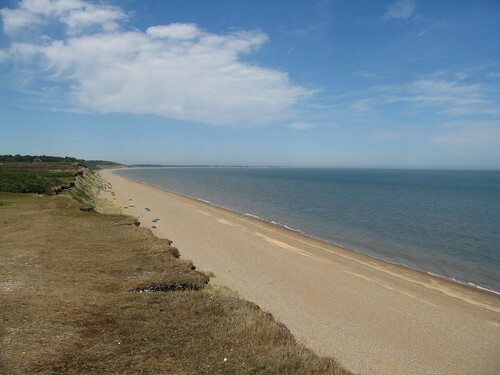 A real Suffolk gem that many are still yet to discover, Kessingland Beach is miles and miles of unspoilt natural beauty. It has a perfect mix of sand, shingle and marsh stretching off into the distance with Lowestoft to the North and Southwold to the South. The wide open, spacious vistas make Kessingland a wonderful spot for a walk, and it’s pet friendly so the dog can come too! 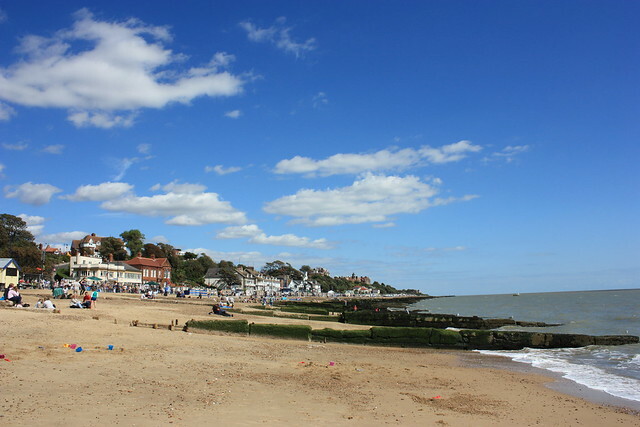 Felixstowe is well known for being a popular family beach due to its various seaside attractions. These included Manning’s Amusement Park, the Promenade and the Seafront Gardens which are all perfect for some family fun and entertainment. The beach itself is a mix of sand and shingle that slopes down into a nicely sheltered bay that’s great for surfing, sailing and windsurfing. With the Promenade being so close there’s abundance of wonderful cafés and eateries to choose from such as Café Bencotto and The Alex. Being by the beach obviously means an abundance of wonderful seafood restaurants and as you’d expect, Suffolk is home to dozens! Make your day at the beach one to remember and treat yourself to a seafood dinner.